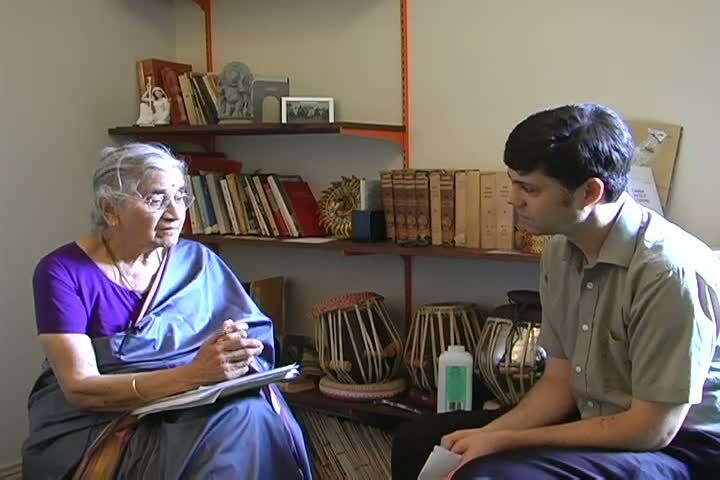 Also, check out Paranjape's piece on Khyal, Improvisation, and Social Change, published in the latest edition of Critical Studies in Improvisation. Silence concert series continues with a new space! 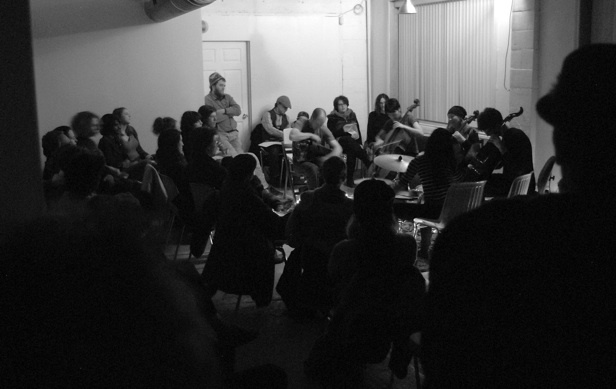 From the March 1st Silence event featuring Theresa Wong, Anne Bourne, Matt Brubek, Ben Grossman and Germain Liu. Photo by Icon Photography. Recently, the ICASP Reading Group Guelph was treated to two exciting talks and an intimate discussion with the eminent musicologists Susan McClary and Robert Walser. This event was part of the Seventh Annual Creative Music Symposium, hosted by the School of Fine Arts and Music. The Guelph Reading Group continues to engage with experts in improvisation studies, as well as providing an accessible space for fervent discussion between students, the community, and faculty. The Thinking Spaces series will continue with meetings on March 25 (Graduate Student Colloquium, which will feature Brian Lefresne, Greg Fenton, Ian Sinclair), April 5 (Tanya Williams), and April 12 (Matt Brubeck). And stay tuned for a special colloquium, which will take place in May - details to be announced soon! Fred Moten’s field is in black studies, where he works at the intersection of performance, poetry and critical theory. He teaches at Duke University, where he is the Helen L. Bevington Professor of Modern Poetry. Moten’s provocative In the Break: The Aesthetics of the Black Radical Tradition (University of Minnesota Press, 2003) takes as its subject matter black performance and black radicalism, arguing that the two concepts are, if not one and the same, generatively related to the point of being nearly impossible to separate. Jazz is not merely the subject matter of much of Moten’s work, but rather in texts such as In the Break it is the stylistic inspiration. For Moten, black performance equals improvisation, and his elaborate, recursive prose reads as an extended experiment with this idea. Harald Stenström, recently retired from his position as assistant professor in music theory and improvisation at the Academy of Music and Drama, University of Gothenburg, would like to bring to your attention his doctoral thesis which is available for free download. The thesis, “Free Ensemble Improvisation,” examines the so-called non-idiomatic improvisation in ensembles consisting of two or more musicians who play together without any restrictions regarding style or genre and without having predetermined what is to be played or how they should play. 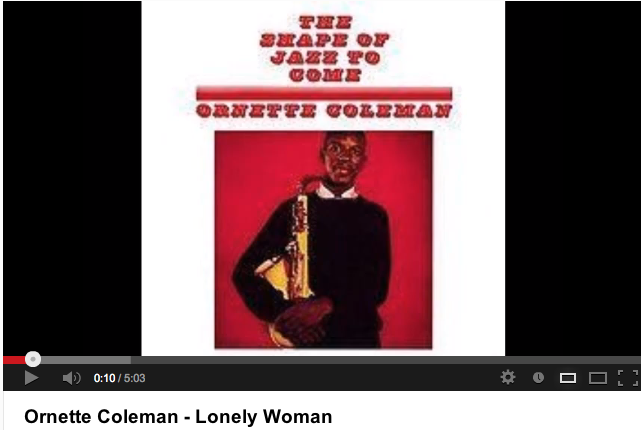 Ornette Coleman, born March 9, 1930, in Fort Worth, Texas, just celebrated his 83rd birthday. Coleman has gifted the world with his music for over fifty years now and was one of the major innovators of the free jazz movement, beginning in the early 1960s. His primary instrument is the saxophone, but he is also known for his work as a violinist, trumpeter, and composer. Largely due to the work of Coleman and others during the 60s avant-garde music movement (Archie Shepp, John Coltrane, Sun Ra, Cecil Taylor, et al. ), improvisation in jazz defies simple categorization, and has ignited furious debates about whether certain improvised music belongs to the jazz tradition or not, particularly since Coleman dropped the album The Shape of Jazz to Come (1959), and then the even more harmonically free Free Jazz (1961). Coleman’s timbre can be recognized by its keening which draws from the blues tradition. A few years back, Coleman received the 2007 Pulitzer Prize for music for his excellent live album, Sound Grammar. Recorded live in Ludwigshafen, Germany in 2005, Sound Grammar features an eclectic mix of old and new material, with clever musical quotations throughout the record. The reception of the album was incredibly positive, appearing at or near the top of many jazz magazines, including Jazz Times and Down Beat. 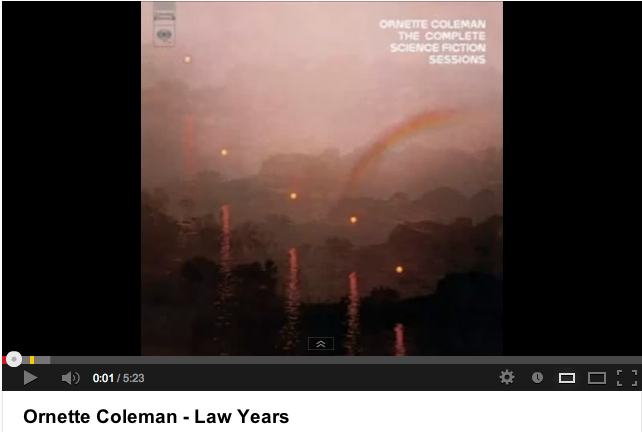 But Coleman’s music was not always so well received. Coleman helped–many argue he was at the helm–steer the course and genesis of avant-garde jazz, a direction that many music critics and neoclassical jazz purists still have trouble with, ever after all these years. Coleman’s early music, such as heard on The Shape of Jazz to Come, definitely—although quite loosely—invokes blues-based influences which are often melodic, while doing so in harmonically unusual or unstructured ways. Many musicians and critics alike saw Coleman as a heretic who tore down jazz traditions with little regard for the “proper” techniques of playing jazz. For example, Miles Davis, in his Autobiography, describes that when Ornette Coleman stepped on the scene he “just came and fucked up everybody” (249) with his new style; a style that Davis argues was one-dimensional because “Ornette could play only one way back then” (250). Part of Davis’s critique was that Coleman would simply pick up an instrument one week and play it live the next, which Davis says was disrespectful to other musicians: “to pick up a trumpet with no kind of training is disrespectful toward all those people who play them well” (250). Yet, even Miles Davis had to eventually give props to Coleman once he realized what he was really doing with music, recanting some of his early criticisms in his Autobiography and describing Coleman’s philosophy of playing a piece three or four ways, independently of each other, as similar to the compositions of Bach. Coleman’s music elicited such responses from both critics and musicians: he was an iconoclast to some, and an innovator and genius to others (as he was to conductor Leonard Bernstein). Such controversy is explored by ICASP researcher David Lee in his fantastic book, The Battle of the Five Spot, which examines the struggle between old and new styles when Coleman brought his quartet to New York’s Five Spot Café in 1959. Coleman often performed with Don Cherry on cornet, Charlie Haden on bass, and Billy Higgins on drums, and later often with his son Denardo on drums. Coleman has played and recorded with all sorts of genre-crossing musicians in a variety of media: from Yoko Ono (he cut a track with her on Plastic Ono Band) to composer Howard Shore (with whom he collaborated on the Naked Lunch soundtrack). After his Atlantic period, and into the early part of the 1970s, Coleman’s music became even more angular in its innovations, and it is during this period that Coleman recorded many of his most daring albums, including Science Fiction (1971) and Skies of America (1972), further developing his musical theory of harmolodics. 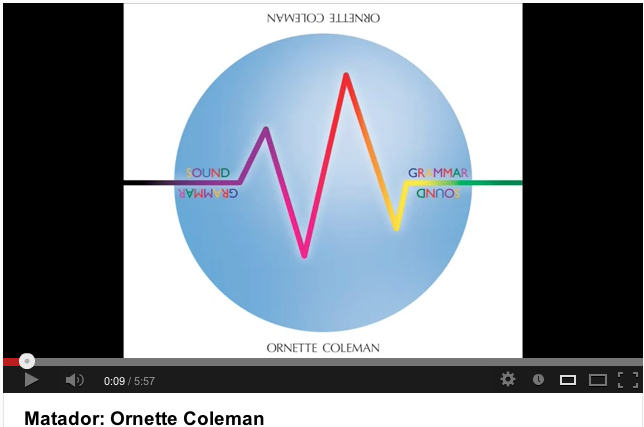 Ornette Coleman asserts, in his description of harmolodic music, it is “The kind of music we play, no one player has the lead” (liner notes, “Science Fiction”), signifying that meaning for Coleman in the jazz tradition is a patchwork of multiple disparate, yet distinct, speaking voices. Aldon Lynn Nielsen asserts in Black Chant that “harmolodic music destroys the conventional view of the relationship between melody line and background musician” (236). The issue of who is speaking becomes less important than an impulse to listen. 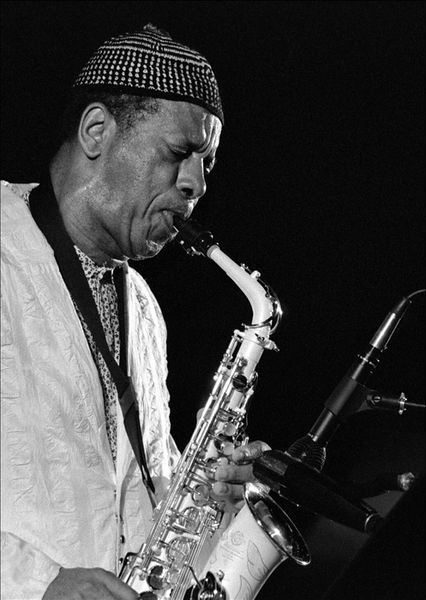 Harmolodics is the musical philosophy of Ornette Coleman and is defined by Coleman as the use of one’s physical and logical components into an expression of sound. Applied to the particulars of music, harmolodics means that “harmony, melody, speed, rhythm, time and phrases all have equal position in the results that come from the placing and spacing of ideas” (“Prime Time” 54-55). Basically, Coleman is arguing for a democracy of sound in music, which can be extended to a freer conception of how we think of the self in relation to a community, something to be taken seriously. And as mentioned earlier, it took time, but his most recent accolades are well deserved: a Grammy Award for lifetime achievement (2007), The Miles Davis Award, a recognition given by the Festival International de Jazz de Montréal to jazz musicians who have contributed along their careers to the evolution of the jazz music (2009), and in 2010, Coleman was awarded an honorary doctorate in music from the University of Michigan for his vast musical contributions. So whether or not you consider Coleman a virtuoso, he remains an obvious giant of jazz, and he is incredibly important to how we conceptualize jazz and improvisation here at ICASP. Have a listen and freely space out to a couple of his tracks below. The International Society for Improvised Music (ISIM) is happy to announce the first of two events focusing on the theme of “Cross-Cultural Improvisation.” The first event, hosted in collaboration with York College / CUNY and with generous support from Arts Council Korea, will be held from June 29-July 1, 2013 and involve workshops and performances of musicians from highly diverse cultural backgrounds. Each day’s schedule will include three to five hours of workshops and rehearsals in addition to the culminating performance on July 1st. The second event, to be held in 2014, at a time and place yet to determined, will continue the cross-cultural improvisation theme, but within the more expanded ISIM festival/conference format that also features papers, panel discussions, and a broader array of daytime and evening performances. Featured guest artists and teachers for the 2013 event will include Korean musicians Gamin Kang (piri, tae-pyong-so, saeng-whang) and Hyun Sik Shin (ajeng), Jane Ira Bloom (saxophone), and Elliott Sharp (guitar). Jin Hi Kim will serve as Program Director. 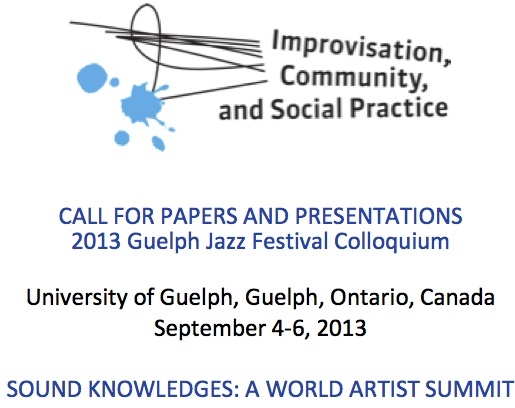 Applications are invited for the June 2013 event from ISIM members wishing to participate as either observers or ensemble participants in one of several groups that will be led by the guest artists. The event presents an ideal opportunity to gain exposure to wide-ranging creative strategies and approaches to improvisation pedagogy, as well as to interact with top-level musicians from highly varied backgrounds. The three-day event will culminate in a final performance at Roulette, an internationally recognized NYC venue for improvised music. Time will also be allotted for ad hoc jam sessions, cultural exchange, and discussions of the unique historical differences in improvisation. 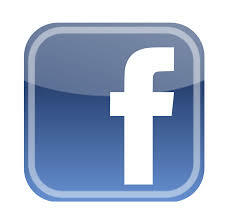 Prospective attendees should indicate if they are interested in participating as observer or ensemble member. To apply for a spot in one of the ensembles, please send a brief biographical sketch that highlights your performance background and audio link of your playing. Limited to 30 ensemble spots. Please save this date: Sunday, April 21st, 2013, 2-6 pm, for the Guelph Jazz Festival’s 8th Annual Sounds Provocative Jazz Art Auction. The auction will be held at the beautifully renovated Holiday Inn Guelph Hotel & Conference Centre (601 Scottsdale Drive, Guelph, ON). Expect a beautifully-curated exhibition by Renann Isaacs, featuring stunning works by emerging, mid-career and established artists who are locally, nationally and internationally recognized.